Also known as the Common Rasp Fern, Doodia media is a fairly upright fern that forms a dense clump over time. Grown for its easy care nature and for the strongly textured foliage which changes colour as it matures. The foliage develops a harsh or coarse texture over time and is a mid green. The new foliage is an added attraction, it emerges with an attractive pink to purple tinge to it. 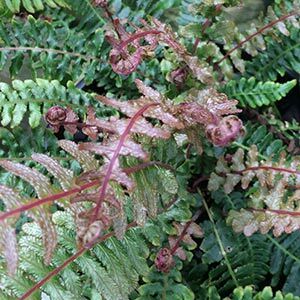 Widespread and found in New Zealand as well as the East Coast of Australia this fern is at its best in early summer as the new foliage emerges. The natural habitat is in rainforest areas where it happily colonises stream banks and other moist shady areas. Over time it will spread by underground rhizomes. This is a fern that grows best in light shade, it is well suited to planting beneath both evergreen and deciduous trees or used to line a shaded pathway. It grows well in containers and is suited to growing in shaded areas near water features. Reaching around 40 cm to 60cm in height . Best grown in dappled shade to a little morning sun. Requires a humus rich soil with some moisture during summer. Fertilise monthly using a native plant fertiliser or a liquid seaweed fertiliser from the end of winter through summer.